Wedding planners are tasked with the incredibly high octane, nerve-racking, round-the-clock job in orchestrating a couple’s big day. They’re the fairy godmothers and -fathers who put their client’s needs above theirs, thrown in with a passion that translates into action. If you’re tying the knot and looking for the one true planner, these are the ‘masters of ceremony’ prominent couples have entrusted in making their happily-ever-afters come true. The name speaks for itself – this Thai-based wedding consultant and design group has created many a legendary setup for all manners of weddings, from receptions to themed celebrations, traditional ceremonies to destination weddings. No venue is too big for their larger-than-life, floral specialty creations. The Rainforest team skillfully puts together forest or garden setting beyond imagination; of sculptures, suspended arrangements and feature walls, playing with height, depth and flower variety – each one more original than the last, but all equally unforgettable and yes, Instaworthy. Celebrity favourite Rizalman is loved for his attention to elegant decorations, which means a combination of majestic bouquets, lighting, centerpieces and even furniture to transform ballrooms into a page from a fairytale book. Each wedding theme is taken from real-life inspirations, with a play on beads, glass, colour schemes, textile, seasonal fresh flowers… the list is endless. Nothing escapes Rizalman’s perceptive vision when it comes to transporting the couple and their guests into an otherworldly grandeur. 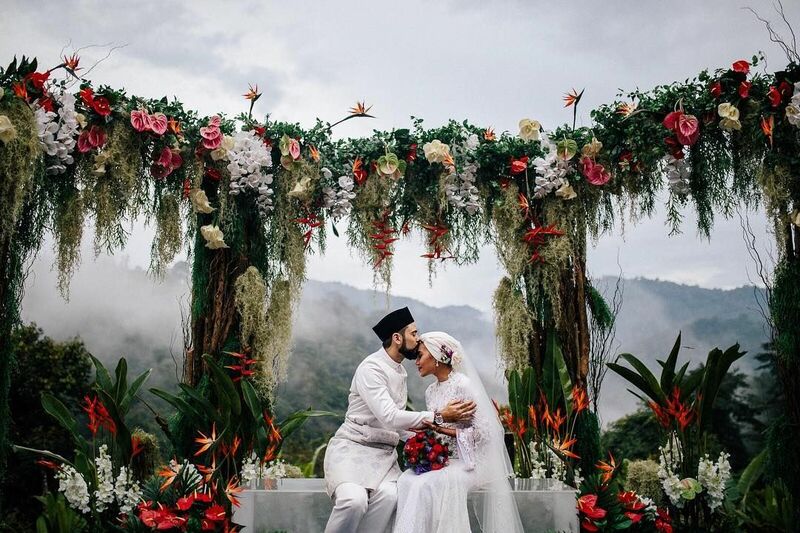 So deep is their faith and love and for each other that whatever Reka Teemor's founding couple plan for newlyweds, the result is breathtakingly romantic. Faiz and Mumtaz are the husband-wife duo whose creative synergy and professionalism have drawn many celebrities and local personalities to engage their expertise into making their day once-in-a-lifetime moment happen. The dream team is dedicated to creating magical ambiances for some of the most prominent weddings in town, for couples including Yuna and Adam Sinclair, and Kelly Roza and Sazahan Yassin. A trusted planner in the field of Malay weddings, Nas Great Ideas’s Nazrul Nazaruddin is celebrated for his expertise in traditional customs and sumptuous, elaborate weddings. You can count on this knowledgeable planner to work with your theme in great, intricate detail while upholding the strict procedures of specific Nusantara ethnicities backed by his academic training in the subject. Among his peers, Nazrul is regarded as a wedding guru, training and nurturing a supportive platform through the community Intensive Weddings, Thoughts and Actions (IWTA), and admired by celebrities including Datuk Seri Siti Nurhaliza Tarudin. Whether it’s a rustic, garden-like fantasy or a modernised interpretation of the traditional nuptial, you can count on The Calla to chase this daydream into daylight. The group is known to smoothly execute the event from start to finish, by working closely with the couple, getting to know their styles and expectations. The era of Instagram means photo opportunity corners are plentiful, done up with custom made flowers and crystal elements. Glamorous is just an understatement for Zuriee Ahmad Concepts. Be it wedding, ceremony, event or even royal banquet, Zuriee Ahmad is the ever reliable party designer to up the the occasion into a full-scale gala. Well known for their flair with ornaments, suspended botanicals, and intricate detailing, clients have received pleasant surprises progressively, as generously thought-out themes and experiences unfold one after another, making for a truly celebratory mood. Big ideas for your big day can be a daunting task especially for perfectionist couples. Jovita Lo Weddings somehow takes these high expectations and compacts them into a cosy ambiance for everyone to feel comfortable and truly connected to the newlyweds. Little touches don’t escape Jovita, who lets details (wedding cards and table settings), decorative corners and spaces (photo corners and wall features) shine, highlighting their role in creating the desired ambiance. With over 40 years’ wedding experience under his belt, Stephen Foong is a highly sought after consultant whose experience is peppered with exclusive know-how of Chinese customs. Gifted at reading couples from the first meeting, Stephen is able to discern the wedding that suits their union. His extensive network and working relationship with luxury hotels in the city make him the go-to for nuptials in the city, in particular among high profile couples. Stephen plays an integral role in KL’s wedding planning scene as the city’s first known, full-fledged wedding consultant, and ensures all traditional and ceremonial obligations are carried out and meet both families’ expectations.